The highly enriched anaerobic bacterium that couples the reductive dechlorination of tetrachloroethene to growth, previously referred to as PER-K23, was obtained in pure culture and characterized. The bacterium, which does not form spores, is a small, gram-negative rod with one lateral flagellum. It utilized only H2 as an electron donor and tetrachloroethene and trichloroethene as electron acceptors in an anaerobic respiration process; it could not grow fermentatively. Acetate served as a carbon source in a defined medium containing iron as the sole trace element, the two vitamins thiamine and cyanocobalamin, and the three amino acids arginine, histidine, and threonine. The cells contained menaquinones and b-type cytochromes. The G+C content of the DNA was 45.3 ± 0.3 mol%. The cell wall consisted of type-A3γ peptidoglycan with ll-diaminopimelic acid and one glycine as an interpeptide bridge. The cells are surrounded by an S-layer; an outer membrane was absent. Comparative sequence analysis of the 16S rRNA sequence showed that PER-K23 is related to gram-positive bacteria with a low G+C content of the DNA. 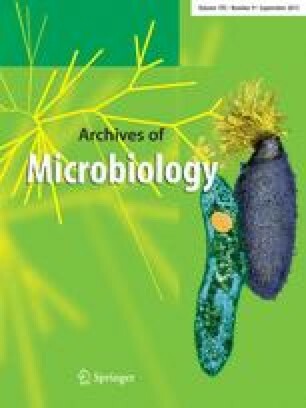 Based on the cytological, physiological, and phylogenetic characterization, it is proposed to affiliate the isolate to a new genus, Dehalobacter, with PER-K23 as the type strain of the new species Dehalobacter restrictus.